HP's 110 desktop is really an odd sort of PC. It is designed to be affordable but is also deceptive because it uses a tower case but lacks most of the expansion capabilities one would expect from the system. At least it is affordable but there are still better options out there. HP's 110 budget desktop has been on the market for some time. It is available as either customer order system through HP or as retail versions. The 110-210 is HP's retail version that uses an AMD platform compared to the Intel platform found on its customizable versions. One advantage this has is a lower price point. The problem is that the solution used here while a desktop class design is really not designed with a tower system in mind. For instance, it uses an external power supply akin to a laptop rather than an internal one for a desktop system. Powering the HP 110-210 is an AMD APU processor, specifically, the A4-5000 quad-core processor. Now you might think that having four cores instead of two would be an advantage, but the processor runs at a much slower 1.5GHz, which means that it actually is slower in many applications compared to the high clocked Intel processors. The 4GB of DDR3 memory also limits how much multitasking and more demanding apps that might take advantage of the extra cores. At least HP has configured it with a single 4GB memory module which means it is easy to purchase a second module to upgrade the memory. The storage for the HP 110-210 has received a bit of an upgrade. The hard drive storage still remains at just 500GB which is a bit disappointing as more and more companies now offer a full terabyte at this price point. For someone that does not have a lot of high definition video media, it may be enough. The big change is with the peripheral ports. The Intel-based 110 did not have any newer USB 3.0 ports which prevented it from having real high-speed external storage. This AMD version now features two USB 3.0 ports. The system also features a dual-layer DVD burner for playback and recording of CD and DVD media plus a card reader for the most popular flash media cards. Graphics are very mixed on the HP 110-210. In general, the AMD Radeon HD 8330 integrated graphics on the A4 processor are typically better than the Intel HD graphics on the Intel chips. The problem is that this is still a very low-end graphics solution which means it still is not really suitable for PC gaming. It can play games at lower resolution and detail levels but will still struggle with having smooth frame rates unless it is an older game. At least the graphics system has better support for accelerating non-3D applications. Of course, hooking it up to a monitor might be a bit of a problem since it does not have an HDMI connector which is the most common form of connector now for monitors. The big issue though is that the motherboard for the system is so small that it does not even have any internal expansion slots. As a result, you are stuck with the A4's graphics with no option of upgrading negating much of the point of buying a standard size desktop tower. 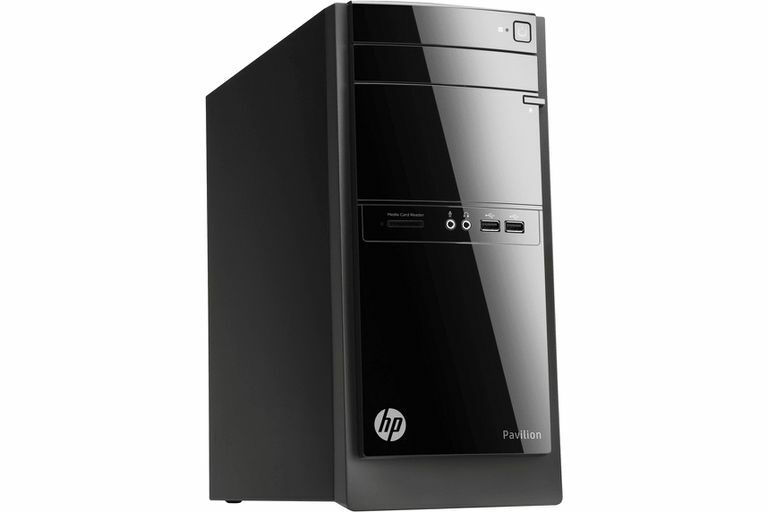 The list price for the HP 110-210 was $400 but it can be found for as low as $320. If it is found at this price, then it is at least a decent value but if it is near list price, there are much better options. For instance, the Dell Inspiron Small 3000 and Acer Aspire AXC-605-UR11 both feature Intel Core i3 dual-core processor for much more performance and feature the ability to add a graphics card even though they use smaller compact tower designs. The Dell even features double the memory and hard drive space while also including wireless networking. To make matters worse, even the HP Pavilion Mini which starts at roughly the same price offers more but in a mini-PC format.